Having grown up in the corridors and reception areas of Cape Town hotels, Guy Stehlik is no stranger to the hospitality industry. In fact, he attributes his passion to the years spent working in the hotels his father managed - his first job was as a bellboy at the age of 7 at The Heerengracht Hotel - and affectionately refers to himself as a “hotel brat”. After matriculating at Bishops and completing his two years’ national service for the South African Navy, the Cape Town-bred hotelier studied at Stellenbosch University the Wits Hotel School in Johannesburg. Eager for knowledge, Guy made his way to Cornell University in New York where he was first exposed to and captivated by the new art of Revenue Management that was pioneered in the USA. Returning from this enlightening experience, Guy was employed by the Hyatt Group (South Africa’s first international hotel group) as part of the team to open the Park Hyatt in Johannesburg in 1995. Here began a successful progression in his career of opening, re-opening hotels and turning around hotels in South Africa. Guy’s entrepreneurial nature and his ability to push the boundaries caught the attention of Protea Hotel Group and he was included in the opening team of the trendsetting Victoria Junction Hotel. Guy accredits the significant success of The Victoria Junction to the fact that they approached the project with unconventional thinking, turning every industry norm on its head in order to produce a distinctively different product to add to the booming hotel industry in the Cape. Guy’s first general manager position came in 1999 at the Protea Hotel Strand Beach in Gordon’s Bay, a challenging position as the hotel required an urgent turn-around. Here a profound relationship was formed with John Saliba, who was the Regional Manager at the time and is now a founding member of the BON Hotels team. With a lifetime in hotels and wanting to broaden his knowledge, Guy accepted an offer at Avis Rent a Car, where his entrepreneurial skills came to the fore and in the five years at Avis, he was responsible for the implementation of many successful business development projects. After a difficult phase in his life, Guy was forced into a period of re-evaluation. Taking a break from the industry allowed him to revisit his passion and re-draft his dreams and duly in 2009, he acquired the Protea Hotel Durbanville and began his plans of creating a hospitality brand that own and manages hotels with a difference. Having vast experience in all aspects of Hotel Management, Guy wanted to create an “owner-, staff- and guest-centric” company that would define a new era in hotel management. And so began the search for GOOD people, GOOD thinking and GOOD feeling, which is the cornerstone of the BON Hotels culture. Guy’s passion for the industry, his entrepreneurial nature and his commercial ability has been the foundation of his success. The BON recipe is a GOOD one and as his flair for surrounding himself with talented people continues, BON Hotels will continue to be a “new force to be reckoned with” in the hospitality industry. 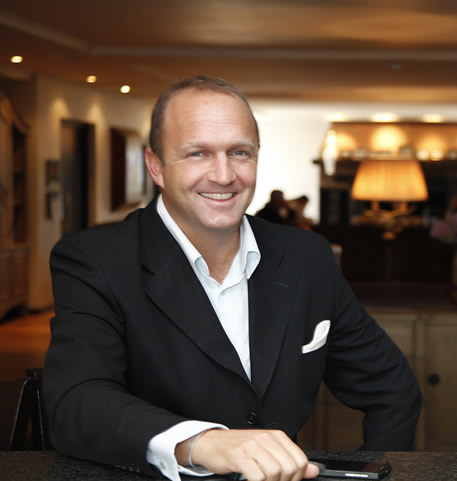 Having grown up in the corridors and reception areas of Cape Town hotels, Guy Stehlik has now risen to the top of the hospitality industry. In fact, he attributes his ongoing passion to the years spent working in the hotels his father managed - his first job was as a bellboy at the age of 7 at The Heerengracht Hotel - and affectionately refers to himself as a “hotel brat”. After matriculating at Bishops and completing his two years’ national service for the South African Navy, the Cape Town-bred hotelier studied at Stellenbosch University and later went on to the Wits Hotel School in Johannesburg. Ever eager for knowledge, Guy made his way to Cornell University in New York where he completed courses in the Science of Hotel Management and was first exposed to and captivated by the new art of Revenue Management that was pioneered in the USA. Returning from this enlightening experience, Guy was employed by the Hyatt Group (South Africa’s first international hotel group) as part of the team to open the Park Hyatt in Johannesburg in 1995. Here began a strikingly successful progression in his career of opening and re-opening hotels in South Africa. Guy’s innately entrepreneurial nature and his ability to push the boundaries caught the attention of the Protea Hotel Group and he was included in the opening team of the trendsetting Victoria Junction Hotel. Guy accredits the significant success of the Victoria Junction to the fact that they approached the project with out-of-the-box thinking, turning every industry norm on its head in order to produce a distinctively different product in the booming hotel industry in the Cape. Guy’s first General Manager position came in 1999 at the Strand Beach Hotel in Gordon’s Bay, a remarkably challenging position as the hotel required an urgent turn-around. Here a profound relationship was formed with John Saliba, who was the hotel’s Financial Manager at the time and is now a founding member of the BON Hotels team. With a lifetime of experience in hotels and still wanting to broaden his knowledge, Guy accepted an offer at Avis as Commercial Manager. His entrepreneurial skills came to the fore and in the five years at Avis, he was responsible for the implementation of many outstandingly successful business development projects. At this time, after a difficult phase in his life, Guy was forced into a period of re-evaluation. Taking a break allowed him to revisit his passion and re-draft his dreams and duly in 2009 he acquired the Protea Hotel Durbanville and began his plans of creating a management company with a difference. Having vast experience in all aspects of Hotel Management, Guy wanted to create an “owner-, staff- and guest-centric” company that would define a new era in hotel management. And so began the search for GOOD people, GOOD thinking and GOOD feeling, which is the cornerstone of the BON Hotels culture. Guy’s undiminished passion for the industry, his characteristically entrepreneurial nature and his shrewd commercial ability have been the foundation of his success. The BON Hotels recipe is a GOOD one and as his flair for surrounding himself with talented people continues, BON Hotels will continue to blaze a trail as a “new force to be reckoned with” in the hospitality industry.